My friend Jahn Schmitz wanted to give special thanks to her guide (and dear friend of several previous trips) at the end of a trip to Turkey, Armenia and Georgia with four fellow travelers. I created a container from an iPad box with the flags of the three countries incorporated into the design on the front. 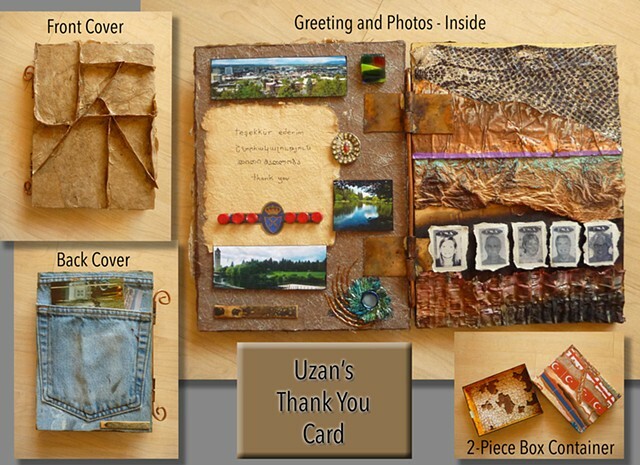 The cover of the card inside was a paper mache creation of a geometric deconstruction of his name, Uzan. The inside included images of Jahn's hometown, Spokane, Washington, and passport photos of the five intrepid travelers as well as fish leather, radiator tape, copper, artisan paper, some found objects and a piece of handmade paper with the words "thank you" in three languages and english. The back cover consisted of a denim hip pocket with Spokane postcards in it. The "card" was bound with handmade copper hinges and heavy wire.